The satisfying and mellow taste of Macanudo Cafe is now conveniently portable with Macanudo Miniatures. I have been smoking these for years due to the time available to enjoy a tasty cigar. On occasion, they must have new rollers as there are times when a bunch are hard to draw. Received a fresh quality product. Shipped in a timely fashion and well packaged. I will shop here again and you should too! Depending on the batch...you can end up with lots of bad cigars (knots, stem holes, etc)...or they can be pretty good. Yeah...and I'll still buy 'em...!!! Love these for a quick smoke. Big Macanudo quality in a great little cigar. These cigarillos are great on a cold day when going outside is the only option. They have the same smooth taste as other Macanudo's. Full size flavor, smaller size. I started out smoking larger cigars. I found I can get full size cigar flavor in a smaller package. I don't usually have time to smoke a larger cigar. It works out well. My first purchase and I am a satisfied customer. Well packaged and shipped timely. I will be back. Overall great experience. Hats off to Best Cigar. No more going to local stores to pay top dollar or find out they are on order. The price and service to the front door are smokin'. Quick smooth smoke. Small in stature but big in taste. A very pleasant and smooth smoke everytime. 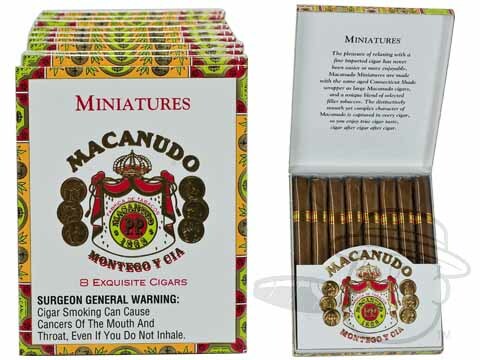 Macanudo Miniatures Cafe is rated 4 out of 5 based on 19 customer ratings.